The first thing to understand with termites is that your home is a very large and attractive food source for them and in fact you could consider your home a very large “bait”. . . it has a large source of food, provides shelter and moisture, and provides many avenues of access so it’s imperative you initiate a systematic termite control program to combat any attempt by termites to enter your home . . . your largest investment. 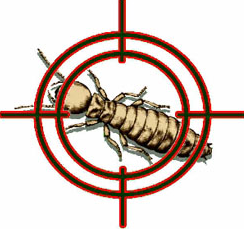 Perth Pest Control understand the habits of termites and know there needs to be a number of strategies in place to eliminate them from your home and we also know that a “one size fits all” approach simply won’t work. When we find termites outside a home we can apply a liquid termite barrier treatment to stop them entering however what happens if they’re already inside your home? Firstly, don’t panic! – you’ve contacted Perth’s experts in termite control and also, don’t spray any chemicals, fly sprays etc as this will only push the termites somewhere else. The next step is to follow the Building Code of Australia’s recommendations and take action that will eliminate not just the localised termite activity, but destroy the colony itself . . . a programmed termite treatment. Yes, we could try and attack the infestation with a liquid spray treatment however we know this is a short term fix and frankly, we refuse to attempt it. What the spray will do is kill termites in the immediate vicinity but not the colony and they will return! And so this is where termite baiting comes to the fore. Termite colony elimination, through baiting and insect growth regulators (IGR’s), was developed by University Of Florida entomologist Dr Nan Yao Su and was then produced by Dow Elanco Chemicals. (Note: an insect growth regulator is a substance that inhibits the life cycle of an insect and effectively prevents it from breeding). Termites are seeking cellulose. This is their staple diet and cellulose is found in wood, cardboard, Gyprock panelling etc and so the logical step was to produce a bait that is not only similar to their natural diet, but goes far beyond to become an extremely attractive food source for termites. Termite baiting is essentially a method of providing an IGR laden material to termites which they will eat but will not kill them instantly as we want to eliminate the colony NOT just a localised group of termites. Once the termites ingest the bait, they will return to their colony and in doing so, by their very nature through contact and transfer of other nutrients with other termites, will pass this material on to other members of a colony. The slow acting nature of the IGR means that great numbers of termites will become infected before it then starts its work of killing the host and eventually the elimination of the Queen and hence, the colony. The Queen by the way, can live up to 50 years! Termite baiting does not involve any broadcast chemicals, doesn’t mean drilling into any floorboards, foundations or walls, and will absolutely eliminate a termite colony if the correct procedures are followed. We use the original Sentricon bait which is a highly advanced, scientifically proven, commercially tried and tested product that will eliminate the whole subterranean colony of termites in a non-invasive and environmentally responsible manner. The Sentricon bait is non-poisonous to mammals so won’t harm your family or pets, it has even won a Presidential Green Chemistry Award in 2000 and is used to protect such sites as the White House and the Statue Of Liberty and locally Royal Perth Hospital have used this bait to protect buildings from termite damage. Monitoring – this is crucial. It involves subsequent checking and replenishment of the bait as required which would generally be on a monthly basis. The bait Perth Pest Control uses in its bait stations is the world’s original . . . not a generic. It’s not only a concentrated form of cellulose, but it has been designed to have a very soft, palatable texture to it that is even more appealing to termites than cellulose derived from wood sources as it is mixed with water (which is the other main required nutrient of termites). Once termites consume this bait, they leave a chemically scented trail that leads other termites to the bait station and this process continues until all members of a colony are eliminated. Make no mistake, bait stations WILL eliminate a termite colony as long as the correct procedures are followed and as a point of interest, Perth Pest Control directors have successfully managed over 10,000 of this type of termite elimination procedure. So how long does this termite treatment take? Once we install a bait station, or stations, on a premise, we will then return, as part of our service, in 4 weeks to check activity and to renew the bait if required. Subsequently we will then return every 4 weeks to continue this operation until we are satisfied the colony is eliminated. We can’t give an exact time till colony elimination but we follow the University Of Florida’s guidelines for confirmation of colony elimination and in a typical colony of up to 5 million termites, it may take 3 – 6 months. Image shows a Sentricon termite bait station with accompanying termite baits. As said previously, if termites are seen inside your home, we could go in with a liquid termite treatment and yes, that activity would “appear” to have been stopped but this is a false sense of security. In time the termites will return somewhere else on your property simply because the colony hasn’t been eliminated. Once we’re confident we’ve eliminated a termite colony, only then will we apply an external liquid barrier to your home to stop further termite intrusion into your premises from any new colony that may forage on your property in the future. Perth Pest Control are experts at termite baiting. We know it works and works extremely effectively in eliminating termite activity once it’s been seen indoors. For further information on this extremely effective method of termite control, contact us and we will have one of our trained professionals conduct a free no obligation site assessment for you.